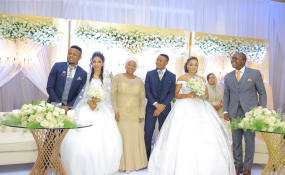 Tanzanian musician Alikiba and his brother Abdu Kiba held a double wedding in Dar es Salaam on Sunday night. The invite only double wedding was attended by relatives, friends and partners in the music business. Abdu Kiba wedded his fiancée Wahida. This was King Kiba's second wedding. He had held a religious wedding in Kongowea, Mombasa with his long-term sweetheart Amina Khalef. The Muslim function, known as Nikkah where a man goes to the mosque to say I do, was conducted at Masjid Ummul Kulthum Mosque. It was followed by a Swahili reception at the Diamond Jubilee hall in Kongowea. The white wedding in Dar es Salaam was attended by Mombasa Governor Ali Hassan Joho, former Tanzania first lady Mrs Salma Kikwete, top Tanzanian celebrities among them singer Ommy Dimpoz, stand-up comedian Idris Sultan, Vanessa Mdee and family members.